When the Lukha river started turning blue in 2007 owing to the acidic effluents discharged by the nearby cement factories, it was the villagers who were the worst affected as the high pollution level killed a large part of the aquatic life. 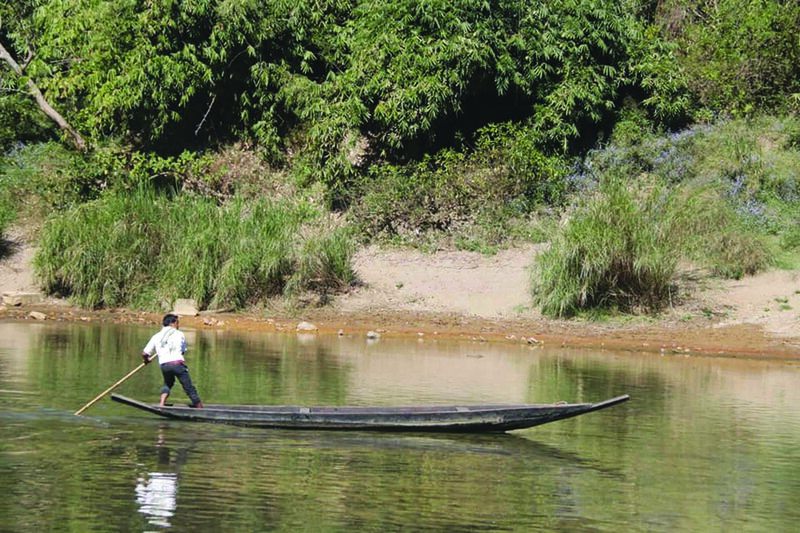 After almost a decade of suffering, villagers of Sonapyrdi, the nearest hamlet, decided to take up the cudgels and revive the beauty of the place in East Jaintia Hills and restore the popularity of the river, which has become a symbol of the state’s degrading natural resources. The Sonapyrdi Tourism and Economic Development Society, or STEDS, was formed by the Dorbar Shnong of Sonapyrdi on May 5 last year. Daiapherbha Lamare, the president of STEDS and village general secretary, came up with a novel idea to promote tourism in the village at a time when the state government was also leveraging resources to expand the sector. “I thought tourism would create employment opportunities for the locals and improve the economy of the region. Besides, preserving and protecting the Lukha river from the pollution and acid wastes coming out from cement factories in Elaka Narpuh are also our agenda,” said Lamare, whose brainchild is the Lukha Festival that was organised on February 1 and 2. The array of events that attracted an impressive gathering included swimming and boating competitions, trekking and definitely music. “Response to this festival was very encouraging. It was highly successful and tickets were all sold out,” the members said. STEDS has around 15 members who are being guided by the Meghalaya Rural Tourism Forum. There will be further training in the field of tourism. Lamare, who was born and brought up in the village playing by the river, is an MBA dropout from NIT Karnataka. His love for nature and homeland brought him back to the village but he was determined to make this comeback purposeful. “I love the Lukha river as I used to play and have fun during my childhood. When the Lukha turned blue from 2007 to 2016, I would feel terrible and often cry helplessly. I started to find out ways and means to protect the river. But now I am happy that at least I have a team to protect and conserve it through STEDS,” said the young member. STEDS got registered with the government last October. Lamare started preparing a road map for promotion of tourism immediately after that. “I have taken many risks in organising this festival as the society does not have any fund. All the members were nervous and we did not know anything. But we went ahead with the festival. I have spent around Rs 80,000 on preparations,” he said. The pollution in the river started decreasing in 2017 and the water gradually changed colour after the cement companies stopped releasing acid wastes. “I can say the river is safe now but let us see (what happens) in the coming years,” he asserted. Lamare said the government always blamed coal mining for the river pollution but “I was born and brought up in Sonapyrdi and I know that the presence of cement factories in our area is the main cause for the pollution”. “The Lukha region has no coal mining. Our area fully depends on agriculture. STEDS can preserve the river but it will write to the government to make sure that correct norms are adhered to in the process,” he added. Kyrmen Shylla, who comes from a family of mine owners and now represents Khliehriat constituency in East Jaintia Hills, was the chief guest at the opening. Lamare said Shylla represents the district in the Cabinet and “we are grateful to him for spending time at the festival”. Talking about the challenges, Lamare admitted that besides fund crunch, the pollution factor is a hurdle but the society is thinking in the long term. The festival, the members feel, will make people aware of the past and the present and the villagers’ endeavour to reverse the degradation. The society is bracing for a daunting task and has decided to make it an annual affair. It also hopes to make the Lukha Festival counted among the most popular events in the state. Shylla has also assured the society members that he would speak to the tourism minister for assistance and protect the river from being polluted from the cement plant byproducts. “My plan for the festival in future is to organise more events and promote the place so that people from outside Meghalaya and even foreign tourists come to the fest making it bigger and better every year,” said Lamare.